We recently received a package of products from RockyMountainSoap and were anxious to try out these 100% all natural items. When I first opened the package from RockyMountainSoap the great natural scent jumped out and really made alot of the house smell good (maybe they should look at candles or room deodorizers as well?). Needless to say, before trying out any of the men’s products they sent over, they made a good first impression. I started with the shave bar. I must say, it was the first time I shaved without starting with some type of cream. The bar makes a rich lather that is unscented and really gave me a smooth shave with no complaints. It was something new and I liked the way the shave bar worked. Next I tried the Men’s Body Wash, which has a guys scent for certain, and helped wake me up with the clary sage oil, coconut oil, and lemon essential oil. Together the make up of the men’s body wash left me feeling clean and refreshed to go out and tackle the world! I’m feeling good at this time and decided to make a RockyMountainSoap day so I applied the Men’s Stuff Deodorant, which also gets to the point and flat out works. The Deodorant is made of natural crystal and had me feeling dry, confident and odor free all day long! The next few products I tried were in some ways new and also very diffucult to keep away from my bride! I am one to use lotion after exiting the shower so when I tried the Men’s Hand Butter, I wasn’t expecting much, but the way it moisturizes you hands is very effective (I already knew it worked because my bride told me so!). Next was something I have never used but my bride (she’s a babe by the way!) assured me she has never seen anything work that good on her feet and she was using it daily. She told me to try it to see what I thought. The Men’s Foot Butter, my goodness, I can see why it’s RockyMountainSoaps #1 product! My feet don’t get overly dry but this product made them feel like the dryness was gone for good. If you suffer from dry and cracked skin on your feet and especially if you spend hours a day on your feet at work , home or in the gym try this stuff now! 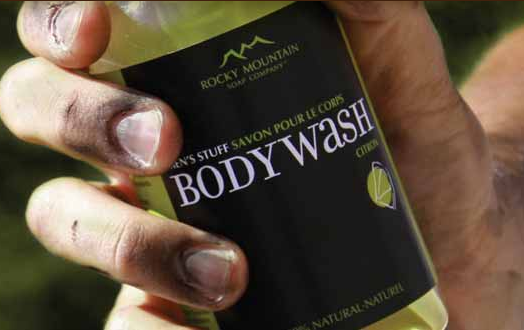 You can read all about the all natural products that RockyMountainSoap.com offers and what makes a great product better and healthier for yourself. When you go purchase on their website and check prices and you’ll see RockyMountainSoap priced their products very competively. There are a few more products I want to test and when I’ve had the chance I’ll give everyone the low down on those as well. In the meantime, if you are shopping for yourself or for the lady in your life remember, www.rockymountainsoap.com has plenty of products for both men and women.